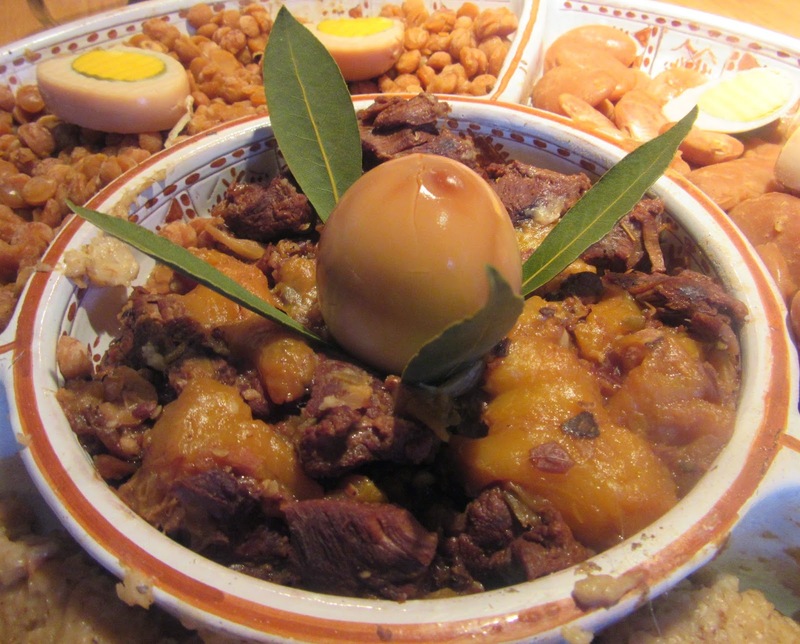 Medieval Spanish Chef: HAMÍA WITH A SEPHARDI MEAT STEW TO LICK YOUR FINGERS! HAMÍA WITH A SEPHARDI MEAT STEW TO LICK YOUR FINGERS! hamín de berzas, jamín (fr Heb warm, kept warm overnight for consumption on the Sabbath), Eng hamin, a Sabbath stew or cabbage stew cooked overnight. Traditionally, Jews were not allowed to work or prepare food during the Sabbath. As a result, hamin, a peasant dish of leftovers, was prepared during the vespers of the Sabbath. 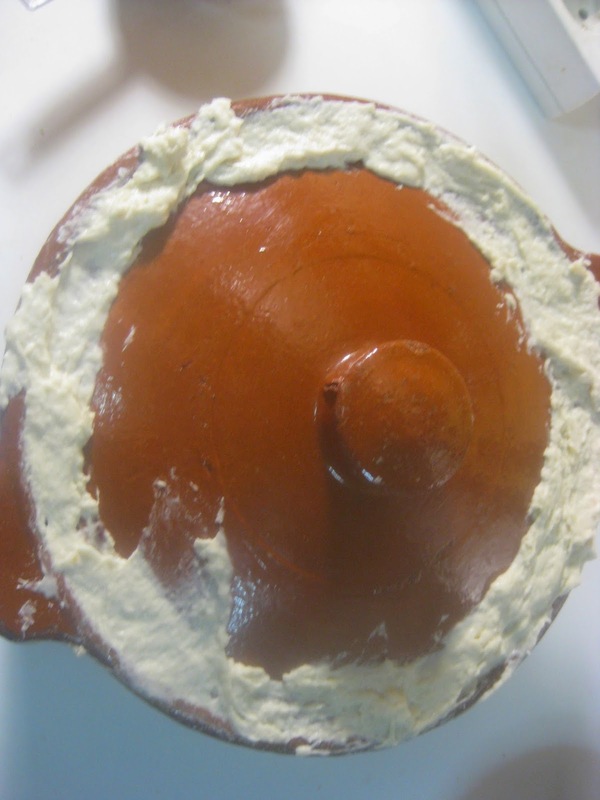 Once prepared, the pot is sealed shut with a paste made of flour and water. A Jewish lad was hired to carry the pots from private homes to the local bakery as homes generally did not have ovens. The lad stayed awake through the night taking care that no gentile products were added to hamin pots, which were left to simmer overnight for 12 hours. The following day the pots were returned to the owners' homes. According to Jewish custom, they were opened for the midday meal and served while still warm. Hamin has been adapted to include available food products. Recipes varied widely between the European Askhenazi Jews who added intestines and Sephardic Jews, from the Mediterranean, who used chickpeas, broad beans, oats or wheat and spices. Dried fruits such as dates, prunes and apricots, added by Sephardi Jews, give the dish a sweet and sour twist. Quince was another addition when in season. Among Spanish Jews, mutton was more popular than beef and rice or chickpeas were used more often than barley. Spices included pepper, saffron and ground coriander seed. A little cracked wheat could be added also. 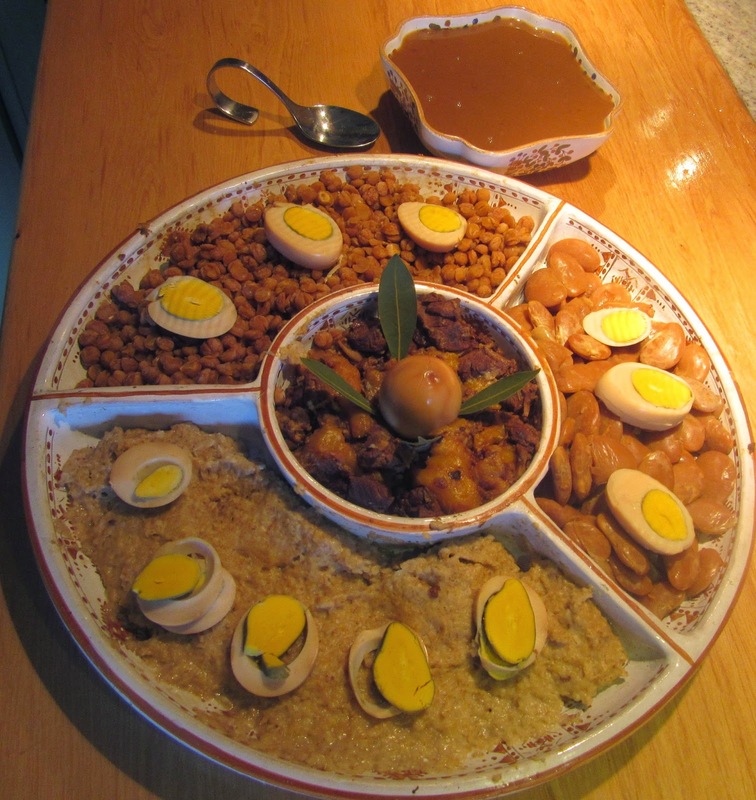 Further, it requires one hard-boiled brown egg (see huevo haminado). Cabbage, a poor man’s dish was also basic in several versions of hamin. Gitlitz relates the history of a converted Jew who received the death sentence in 1486 for eating cabbage hamin. Soak chickpeas and broad beans separately overnight. 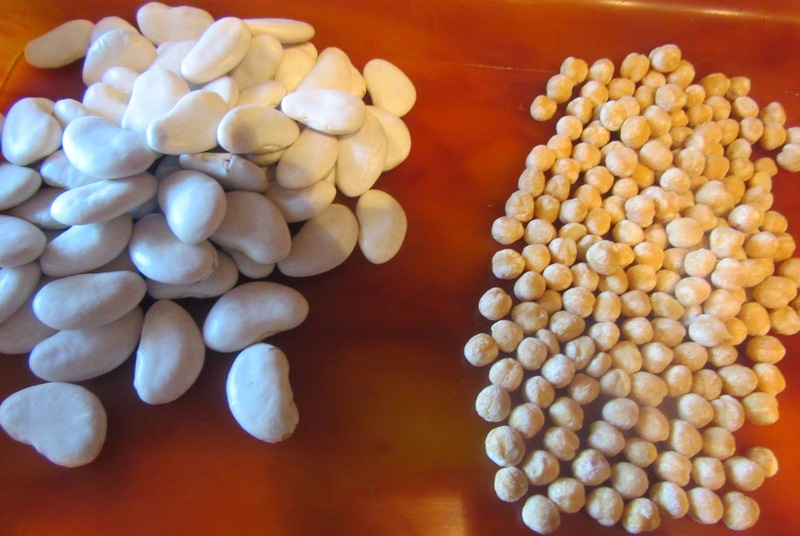 Rinse chickpeas and broad beans and put each in a cloth bag. Put oats in another cloth bag. Dice the meat and put it in the bottom of a pressure cooker or heavy pot. Add bagged ingredients. Pour prune marmalade over this. Peel peaches and remove pits. Add them to the pot. Bury the eggs in this mixture. Top with bay leaves. Chop and mash garlic cloves and add them to the pot. Prepare a meat broth, add duke’s powder, cumin, cinnamon and white pepper to it. Mix well and pour over the meat and other ingredients. Tightly cover to prevent evaporation. Put over very low heat, an electric burner or a gas burner with a metal plaque between gas and pot. If using a pressurer cooker, simmer for 4 hours. If using a heavy pot seal it with a mixture of flour and water. Simmer 8-12 hours. This is scary, as it can burn if too hot but so far the Medieval Spanish Chef has not burned this recipe. Remove from heat and let sit until ready to serve for the mid-day meal. When ready to serve, remove the lid from the pot. Separate the solids from the liquid. Put the liquid in a bowl to serve separately as a sauce. Arrange the chickepeas, broad beans, oatmeal and meat separately on a large dish or platter. Decorate with brown eggs. Serve warm. Recipes call for 10 dried and pitted prunes but as they were not available, the marmalade contributed to the hispanic sweet to the sour tradition. Recipes call for 6 dried and pitted apricots but as not available the peaches contributed the sweet to the sour flavor.